The basic settings of WP Project Manager can be found in Project Manager → Settings → General tab. File Upload Limit: You can define the maximum file upload limit here in megabytes. This field only takes numerical value. Projects Per Page: This option defines how many projects will be shown on the project listing page. By default, it is set to 10. You can increase it to any number you want. If you want to display all the active projects, then you can put -1. Task Lists Per Page: Use this option if you want to customize the number of task lists which will be shown Per Page. By default, the number is set to 10. But if you want to show only one task list per page then replace the number with 1. Incomplete Tasks Per Page: You can define that how many incomplete tasks will be visible under the Task List name. By default, it is set to 10. You can modify as you need. Completed Tasks Per Page: Like “Incomplete Tasks Per Page” you can define that how many completed tasks will be visible under the Task List name. Again, by default, it is set to 10 which you can modify anytime as you need. Project Managing Capability: By default, the administrator, the editor, and the author are granted the access to everywhere. But you can enable certain user roles in your organization to Project Managing Capability. Please note that the settings option of Project Manager is only accessible by the administrator. Project Creation Capability: By default, the administrator, the editor, and the author are granted to create projects. But you can enable certain user roles in your organization to create a project anytime. 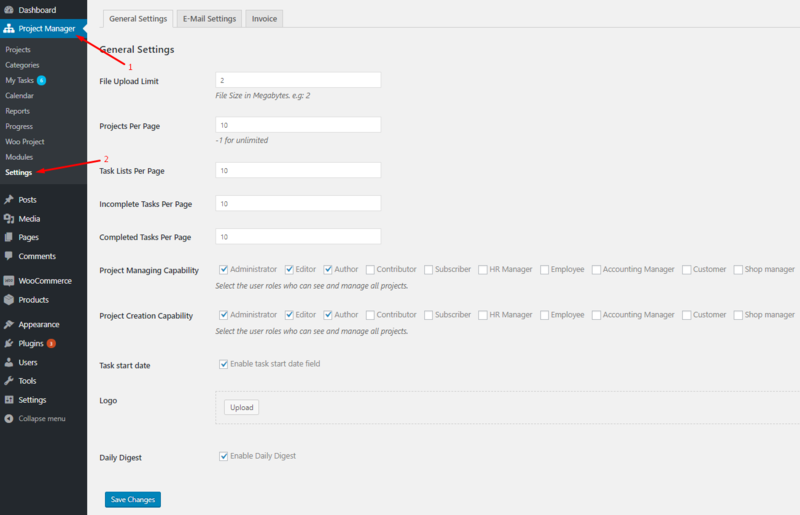 WP Project Manager does not register any new user role in WordPress. It works with the available users and roles. If you need to use different user roles, then you can use a third-party plugin to register new user roles, assign them to the existing users and give them different capability. Task Start Date: If you enable this option, you can define its start and end date while creating a new task. Logo: WP Project Manager has built-in email notification and daily digest features. The logo you put here will be used on those emails for branding. Daily Digest: Daily digests are just an email automatically sent to each user associated with an active project to know about the progress and pending tasks. This email is sent once every 24 hours. If the user is not assigned to a project or the project does not have a task assigned to the user, then he will not receive any digest email.